Whether you are taking your mountain bike for a ride on the local trails, packing your cruiser bike for a trip to the beach or bringing your road bike along for family vacation, you may find yourself needing to remove the front wheel to take your bike where you want to go. Removing a wheel from your bike will make it easier to fit in the back of your car and some bike racks require the front wheel to be removed before you can strap your bike into the rack. You will also need to know how to remove a wheel if you get a flat tire. Check out our video on how to remove a bike tire and fix your flat. Quick Release or Thru Axle? A quick release axle has a 5mm rod with a camming lever on one side and a nut on the other and its function is to allow you to remove the wheel of your bicycle without the use of a tool. A quick release axle also allows you to remove the wheel without removing the axle. The axle will stay inserted in the hub. All you have to do is pull the lever to the open position and loosen the nut on the other side. Some bike hubs (particularly mountain bikes) require larger axles (12mm, 15mm or 20mm), which are called thru axles. These axles also have a camming lever on one side of the hollow rod, while the other side is threaded into the fork. 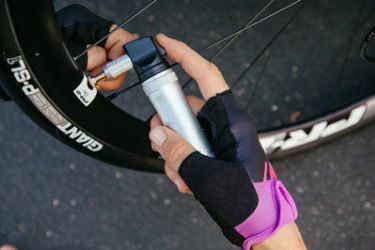 This system allows you to remove the wheel without the use of any tools BUT you do have to remove the axle from the hub to take your wheel off of your bike. If you have a bike rack on top of your car that requires you to remove your front wheel, make sure you have the correct adapter for your bike’s axle! 1. Release Your Brakes: If your bike has rim brakes or cantilever brakes, you will need to release the cable tension so you can remove your front wheel. For rim brakes, there should be a lever near the caliper that will release some cable tension, thus allowing your brake pads to be far enough from the rim for your tire to slide past them. 2. Flip Your Bike Over: Flipping your bike over to remove your wheels is ideal, unless you have a mechanic stand handy. When you are changing a flat tire on the side of the road or trail, allowing your bike to rest on the seat and handle bars will give you a more stable platform to work with. Flipping your bike over makes things a little easier and reduces the risk of your bike falling over after the wheel is removed. 3. Open the Quick Release or Remove Axle: If your bike has a quick release, flip the lever into the open position. If the lever is tight, you can use a tire lever to pry it open. Holding the lever still, loosen the bolt on the other side of the axle, but DO NOT remove the bolt completely. For thru axles, open the lever into the open position and turn the lever counter-clockwise to unthread the axle and remove it from the hub. 4. Lift the Wheel Up and Out of the Fork: Make sure you do not dislodge your calipers if you have rim brakes and be careful with rotors if you have disc brakes. 1. Guide Your Wheel Back Into The Fork: If you have rim brakes, be careful not to dislodge calipers when you reinstall your wheel. If you have disc brakes, guide the rotor in between the brake pads. 2. Tighten the Axle: If you have a quick release axle, settle the wheel completely into the dropouts. Make sure the quick release axle is on the non-drive side of the bike, matching the wheel. Holding the lever in place, tighten the nut on the opposite side and push the lever into the closed position. It should feel tight, but it should not be too difficult to close the lever. If you have a thru axle, line up your hub with the holes at the bottom of your fork. Look to see which side of the fork is threaded and push the axle in through the opposite side. Turn the lever clockwise to thread the axle into the fork. Once tight, push the lever into the closed position. 3. Flip your bike over: If you have cantilever or rim brakes, make sure your brake cable is reconnected or tightened properly. 4. Spin your wheel: By spinning your wheel, you will make sure your brake pads are not rubbing the rim or the rotor. If your wheel does not spin, it could be crooked in the fork’s dropouts. Flip your bike back over, loosen your axle, push down on the wheel and tighten the axle again. Need to learn how to remove your rear wheel? Check out our video! Helpful Tip: If you have hydraulic disc brakes do not squeeze the front brake after you have removed your front wheel. The brake pads will move closer together and you will not be able to get the brake rotor back between the pads. If your brake lever is accidently compressed, the ideal tool to separate the pads is a pad separator tool. If you do not have this tool, you can use a flat bladed screw driver or a credit card to wedge in between the two pads and carefully work them apart. It is possible to damage the pads if you use too much force. Also, make sure whatever tool you use is clean so it does not contaminate the brake pads. Replace the wheel and squeeze the brake lever a few times to reset the pads.